There is one man, and one man only, whose prolonged absence would reduce the Steelers’ chance of winning the Super Bowl to precisely zero. You know who it is. Every single person in the locker room, coaches room and board room knows, too. Ben Roethlisberger missed four games last season, and the Steelers needed Rex Ryan’s help in Week 17 just to make the playoffs. They were 2-2 with a popgun passing game when Roethlisberger did not play. They were 8-4 with a dynamic aerial attack when he did — including a game in which he replaced an injured Landry Jones and turned in the most prolific relief appearance in NFL history, torturing the Cleveland Browns for 379 yards and three touchdowns. The Steelers would have succumbed in the wild-card round without an injured Roethlisberger replacing Jones for the final drive. Big Ben might be losing weapons, one by one, as training camp approaches, but he still has enough — notably the great Antonio Brown — to inflict serious damage in his age 34 season. Truth is, his game has never looked better. He just needs to stay on the field. If it seems like Roethlisberger has become terribly fragile, the record shows otherwise. He has started 43 of the past 48 games —- 46 of 51 including playoffs. And that doesn’t include his immaculate relief performance against the Browns. On the other hand, he started a career-low 11 games last season, sustaining four significant injuries along the way (sprained MCL, sprained foot, concussion, damaged shoulder). On the other, other hand, he has evolved into a quick-release passer who was sacked on just 4.1 percent of his attempts last season, easily the lowest mark of his career and fourth-best in the league. 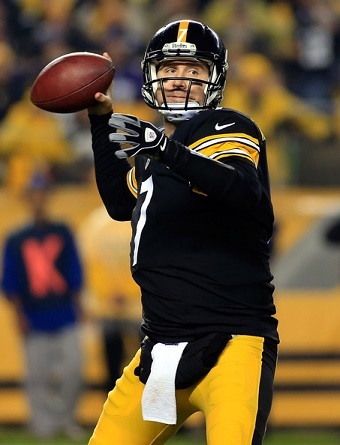 If he can stay in one piece, Roethlisberger has the look of a quarterback who will remain elite for another handful of years, a la Tom Brady, John Elway, Peyton Manning, Brett Favre, Drew Brees, Joe Montana and others who were/are still getting it done into their late 30s. Roethlisberger’s arm is in excellent shape. His deep ball has never looked so sweet. His short game isn’t bad, either, evidenced by his career-best completion percentage of 68.0.